Shutters aren't just for windows. They could be the perfect under stairs storage solution. You are here: Home / Product News / Shutters aren’t just for windows. They could be the perfect under stairs storage solution. 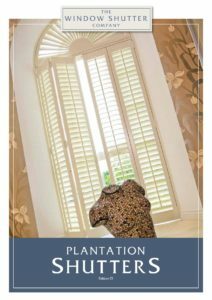 Plantation shutters continue to grow in popularity in the UK. As one of the most flexible and durable window dressings on the market, shutters are a stylish addition to any property. It doesn’t just stop with windows though. Shutters could be used as a cupboard door or as a way of sectioning off an area in the house. We can shape a shutter to suit your needs, which would make them ideal for areas such as under the stairs. They are a creative way of enclosing the space and achieving extra storage, whilst looking modern and stylish. 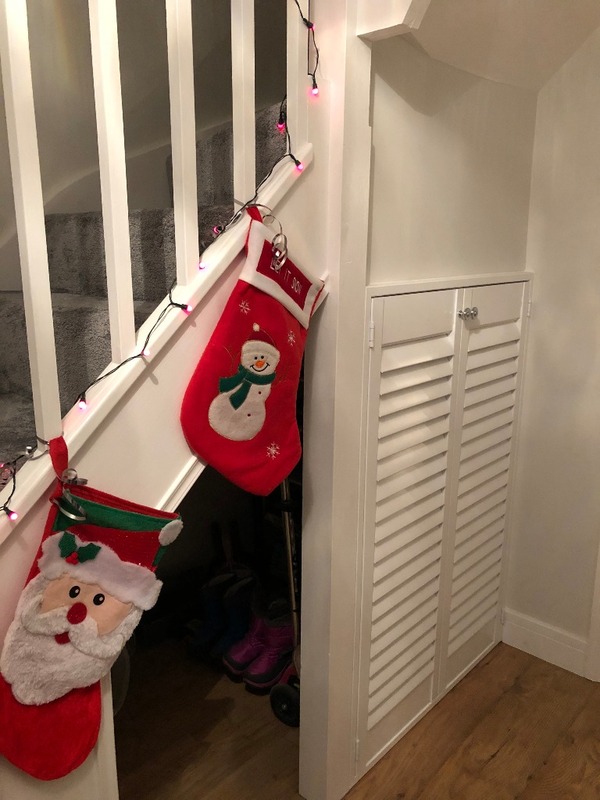 We tried this out in our own house as a way of disguising an otherwise cluttered space under the stairs. 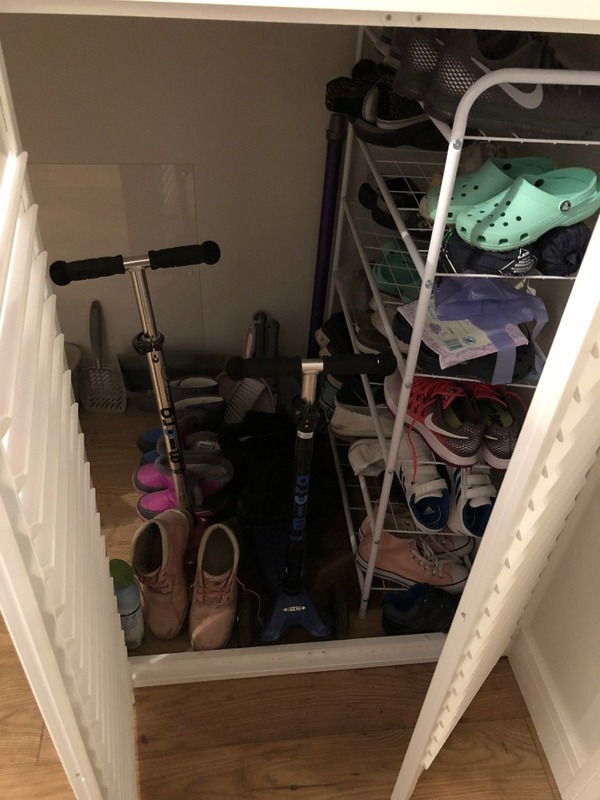 With two young children and two elderly cats in the household, like a lot of people, we were trying to maximize the space on offer to us to store stuff! We have simply fitted a two panel rectangular Seattle (LDF) shutter in the larger section of the opening and it encloses the space perfectly! We decided to leave the angled section exposed so that the mogs can access their beds. 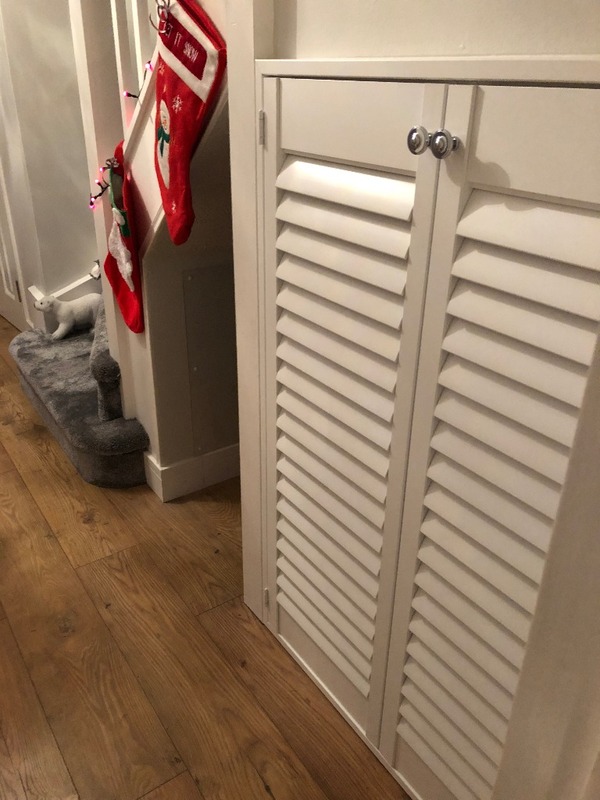 We could easily have installed a shaped shutter to this section too and would have a totally enclosed area that would have finished off the hallway perfectly. The covered section can house exactly what we need it to. We were aware of some of the brilliant under stairs storage solutions but didn’t want to be restricted to what it can house once installed. For example, many of the solutions have drawers and maybe a cupboard, but by retaining the open space behind, we can change this around to suit our needs at any point in time. The kids wellie boots are only going to get bigger after all! 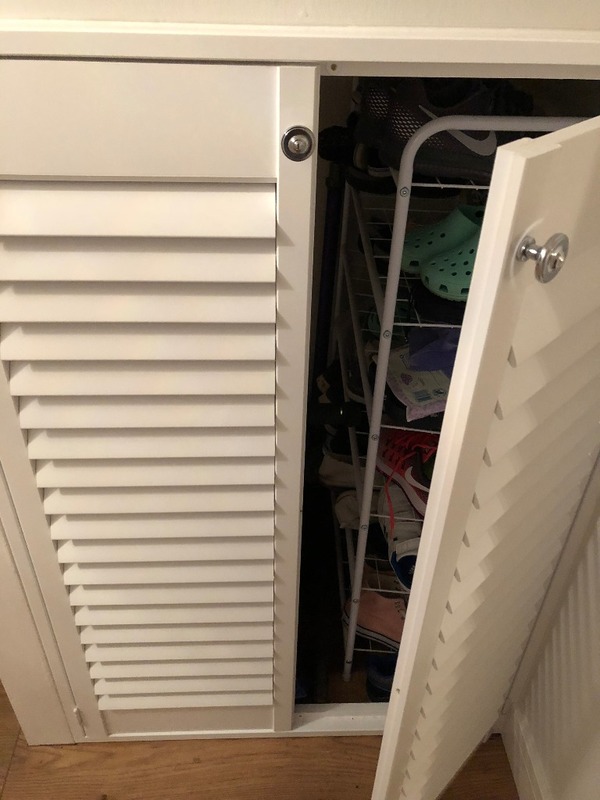 Using shutters with louvres allows good ventilation to the covered space whilst shielding anything that is stored behind which is great if you’re putting away damp clothes or shoes. You can also angle the louvres to suit. With numerous colours and configuration options available with shutters, we think this is a creative and interesting way to use shutters within the home. Plus, if you have shutters elsewhere in the house, they can complement the colonial/plantation theme already being used!